More than 200 Stanford University students and members of the Palo Alto community gathered today at noon at Cogswell Plaza to protest a Missouri grand jury's decision not to indict Ferguson police officer Darren Wilson in the fatal August shooting of 18-year-old Michael Brown, according to a university press release. 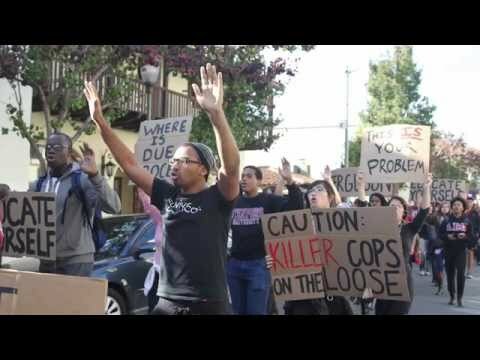 The Stanford group and community members took part in the peaceful protest in downtown Palo Alto to express solidarity and bring awareness to Stanford, Palo Alto and the larger region, according to the release. Protesters gathered at the intersection of University and Emerson avenues near Lytton Plaza where traffic was blocked off, and continued to City Hall for a rally. "Even if Darren Wilson had been indicted we were aware that this would not have meant justice being served, so we planned this action according to that," said Tianay Pulphus, a St. Louis resident and president of Stanford NAACP, in the press release. Palo Alto police guided the large group of protesters down Palo Alto streets, and redirected traffic to keep the rally safe for everyone. The police department tweeted, "We share a commitment with the event organizer for a safe & peaceful demonstration. We are on hand to ensure the safety of all." Sonya Clark-Herrera, co-founder of the East Palo Alto-based Mural Music & Arts Project, said "the policies of racial and economic injustice have left youth from certain neighborhoods disenfranchised and under resourced." "Today we find these youth suffering from secondary trauma and violence, and enduring racial profiling and harassment," Clark-Herrera said in the press release. "It is imperative that we amplify our collective sadness and reflect upon the crushing inequities prevalent in this great nation through peaceful protest this afternoon." For more information and updates, follow @SiliconShutDown on Twitter. To see photos from the protest and rally, visit the Weekly's Storify here. Just obey the law, be we black, white, yellow or brown people, respecting the authority of members of law enforcement that American societies pay to protect us, and at the end of the day our lives ought to be fine. Disrespecting authority and disobeying laws is a choice, one coming with consequences. Some consequences are harsher than others. Do they not teach this, at Stanford? Palo Alto is insulated bubble. Who are you to judge? Meanwhile, 244 people have been shot in Chicago since the Ferguson event occurred. Anyone care to protest that? Make no mistake, its a tragedy when anyone dies, so I'm sorry for the Brown family's loss. However, to elevate this young man to icon status is a real mistake. He acted very foolishly by assaulting a police officer (and earlier assaulting a completely innocent store clerk). These actions led to his tragic death. Unfortunately, rumors about the circumstances of his death became accepted as fact within minutes, and so many people give in to their worst emotions and somehow justify further violence and mayhem. The news media has certainly helped by repeatedly characterizing him as an "unarmed black teenager" instead of a "large man," which he was. He was 18. A legal adult, who apparently had a hard time understanding that pushing people around has very serious consequences. Even if you disagree with the verdict, screaming, yelling, vandalizing and looting won't bring Brown back. If you have THAT much time on your hands, and no responsibilities, why don't you build UP the world around you - find ways to volunteer. Help with literacy programs, coaching, mentoring, that kind of stuff. Gee just got done reading an account of how Sherman's troops torched the entire city of Columbia SC. Got that warm fuzzy feeling as Federal prisoners released joined newly freed slaves to give justice to the bastion of the Confederacy. Then turn on the news and that racist epicenter of Ferguson MO getting the torch. Some weeks are just better than others. cgilbert is a registered user.